Montecasino’s 5th annual Christmas Village will once again transform our Outdoor Piazza into a magical European-style Christmas market from 12 - 17 December 2018. 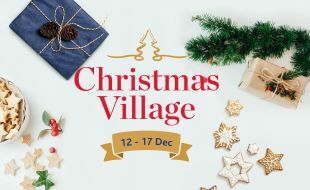 Featuring over 60 exhibitors showcasing all-things-Christmas, Montecasino’s Christmas Village is THE place to celebrate the Festive Season with family and friends! SHOP: stock up on unique gifts; magical festive decor to transform your house, tree and table; mouth-watering Christmas cakes and decorated biscuits; twinkling fairy lights; chair covers, gorgeous Elf dresses for little girls and handmade reindeer hats for babies; picnic baskets for Christmas Day outings; wooden boards on which to dish up the perfect Turkey – and so much more! EXPERIENCE: the magic of Christmas shopping under twinkling fairy lights whilst the kids enjoy movies on our Big Screen. No rush and no additional cost – just time to relax and unwind! INDULGE: enjoy an ice-cold craft beer, relax and unwind at our trendy gin bar, cool down with a champagne popsicle, devour a freshly-made churro and fill up on delicious gourmet burgers! There's no better place to celebrate a "Buon Natale" (or "Happy Christmas") than right here at Montecasino!